Scratched into a cornerstone of this early stone structure is the date “1796." The Andrew Bogie House may therefore be the oldest of the few remaining stone houses in Madison County and perhaps the first with a wood-shingled roof. 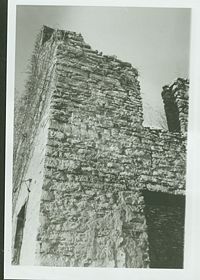 The ruins have walls two feet thick which suggest the house’s original appearance. The front had two entrances leading to two separate rooms on each of the two stories. Although fire has destroyed much of the interior, mud plaster on some walls and some wooden lintels over the openings still remain. The house was one of several stone residences on Silver Creek built by the Bogie brothers. Thomas, Andrew, and James, who arrived there in 1777. The brothers were Scottish immigrants who came to Kentucky via Buckingham County, Virginia. Supposedly, they brought the first herd of cattle to Madison County. In addition to farming several hundred acres, the Bogies built two mills, operated a blacksmith shop and a distillery, and made gunpowder from saltpetre found in a cave near Silver Creek. The house reputedly stands on or near the site of a fort built by Squire Boone between 1775 and 1780. Nearby, gravestones on top of a prehistoric mound, called Bogie’s Mound, mark Andrew Bogie’s (d. 1823) and other family members’ burial places. This page was last modified on January 19, 2009, at 21:04.